My Time to Craft is Circle Circus. Papers and card are from my stash, still keeping to my use it up promise. The little dog was a free stamp from the wonderful magazine Craft Stamper. MAKE MY MONDAY. For my card, I used a piece of backing paper, to fit in my black and white theme. 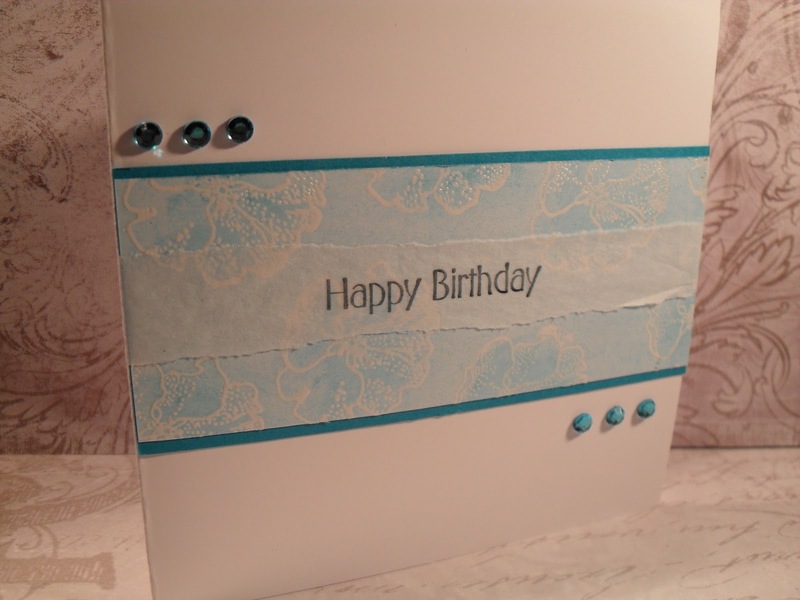 Added to the top edge a punched piece of card, from using a Martha Steward border punch. The large flower was made from cutting out several flowers from a piece of backing paper and mounting them up, adding a brad with a clear gem on top. The circles with the ladies are stamps from Debbie Moore, I have had them a long time but I do find the ladies very attractive and useful for many different cards. I have glittered the flourishes on their hats, their jewellery, all over really. Diamonds (gems) added to each circle. I, again look forward to visiting your blogs to see your Diamonds and Flourishes. For the next two weeks at Fashionable Stamping Challenges we would like you to make a card for a child, any age/ any occasion. As we are surrounded in our family by boys, with only one girl, I though maybe a card for one of the boys would be useful to get ahead. Pirates are very popular, thanks to the wonderful Johnny Depp and the Pirates of the Caribbean series of films. I bought this set of Pirate stamps ages ago and almost forgot I had them. 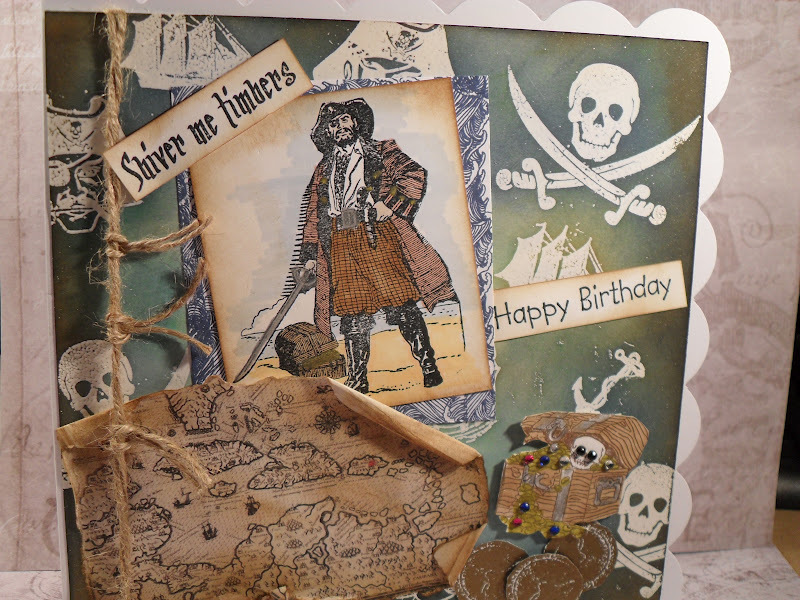 The pirate is actually from an old wooden stamp which I removed from the block and adjusted, I am much happier with him now. 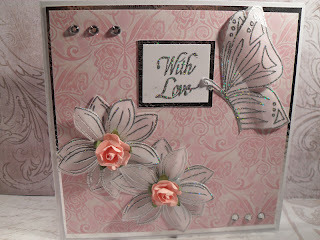 I heat embossed several stamps to provide a resist for when I added several colours of TH Distress inks to the main card. I acquired an old map, distressed it , added a red cross on one of the Caribbean islands, to mark the treasure. Seems they have found it, a chest with jewels and doubloons. I added some twine to look like rope on the ship, with a few additional slip knots. 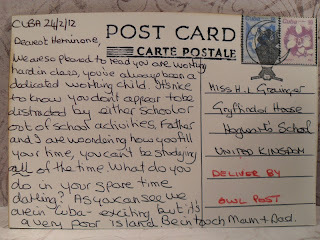 i look forward to visiting your blogs to see the Child's Card you have made. Please do to pop over to the main blog for the Design Team have made amazing cards for this challenge. Important things to remember are we don't allow Digi Stamps,and there must be some very evident stamping showing, for it is Fashionable Stamping. Have fun and thanks for your visit and if you have left me comments, many thanks for those too. 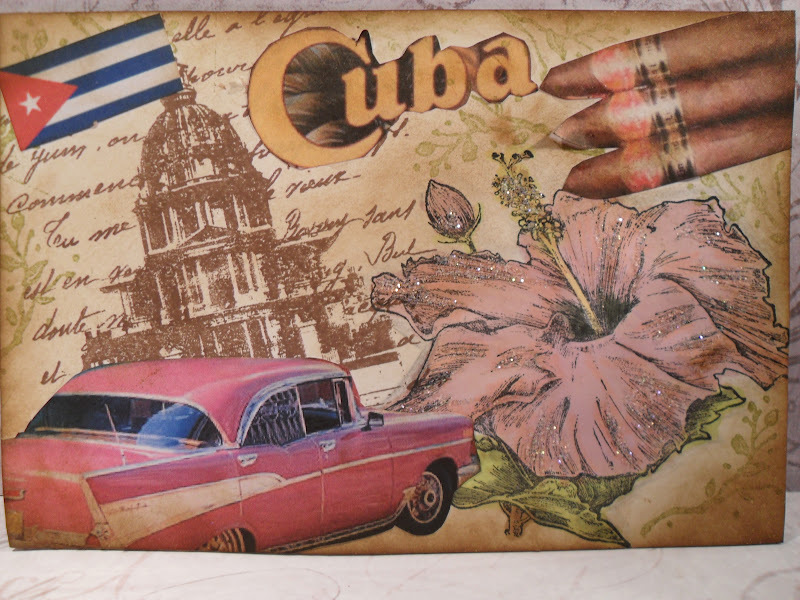 Week 8 of Darcy's Postcard Challenge takes us the the Caribbean island of Cuba. 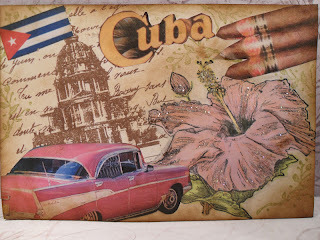 Through my research I found some amazing bits of trivial but interesting information about Cuba. Since the Revolution in 1959 there have been no new cars imported to Cuba, the island still has thousands of pre-1959 Classic American cars, which are kept in pristine condition and are very much a status symbol within the Communist country, it's full name being the Republic of Cuba. Christopher Columbus established the island, hence the large numbers of Spanish churches and Spanish architecture. being in the Caribbean there is an abundance of beautiful tropical flowers. Havana cigars are classed as the best cigars in the world. One of the greatest exports the Cubans can boast of is qualified Medical Doctors, they are loaned to over 40 countries. I have used Indigo Blu stamps, from The Grand Tour II for the old building. The flower is from an old set of Tropical Flowers from See-D's, which I coloured with Promarkers. To answer a previous question, I stamp the majority of my images or use cut outs from downloads. I can not draw, even a match stick man. Mr. and Mrs. Grainger are currently visiting Cuba, in their search for information which could be useful before the end of the year to help them to prevent something awful happening to their daughter. 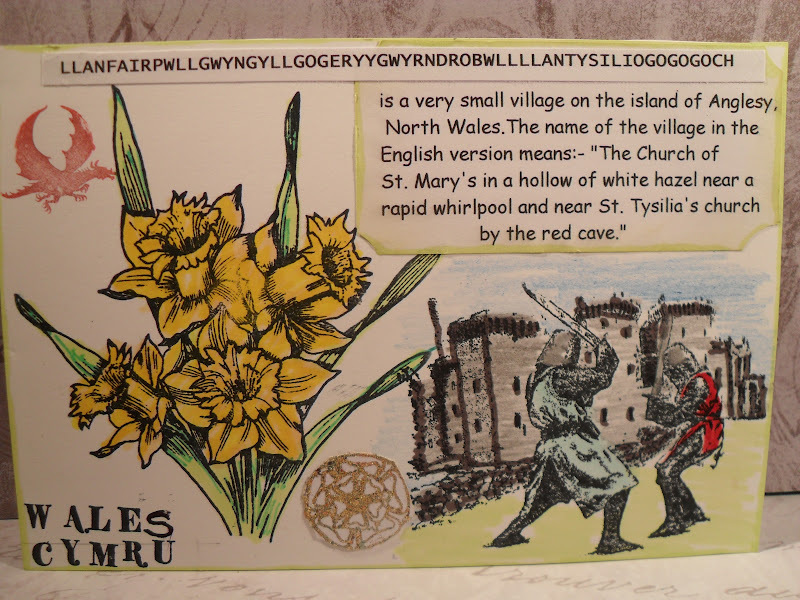 I would like to thank the many visitors I had last week to see my card from Wales. Also to thank all of those who left splendid comments which I greatly appreciate. I have enjoyed the challenge of Cuba, for I found the research much more interesting than I thought it would be. 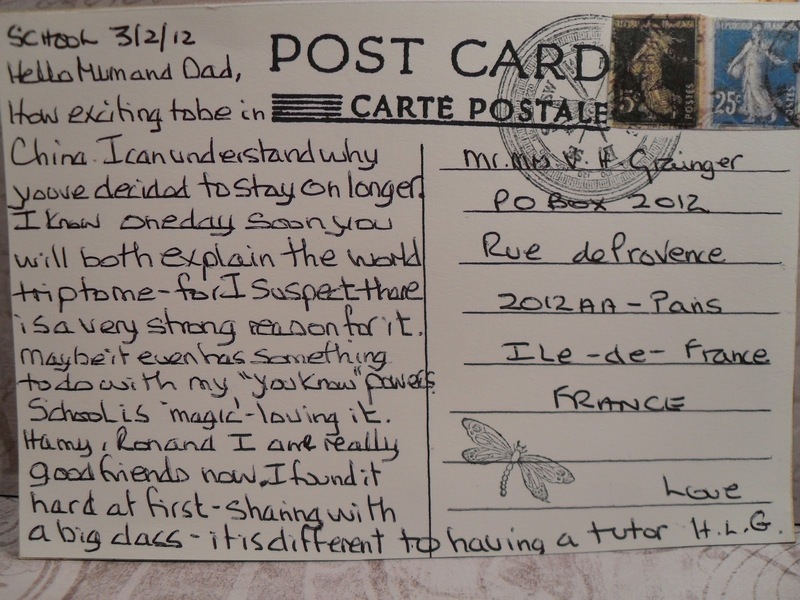 I am so glad I am on this Postcard Journey for if I was just visiting I would truly feel left out of a fabulous experience. Thanks again Darcy. I wonder where to next Monday? 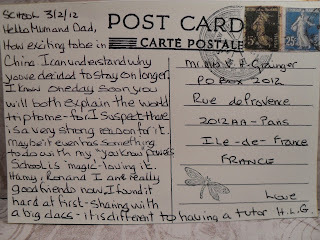 To see other traveller's postcards click on the side bar for the Postcard Challenge 2010. 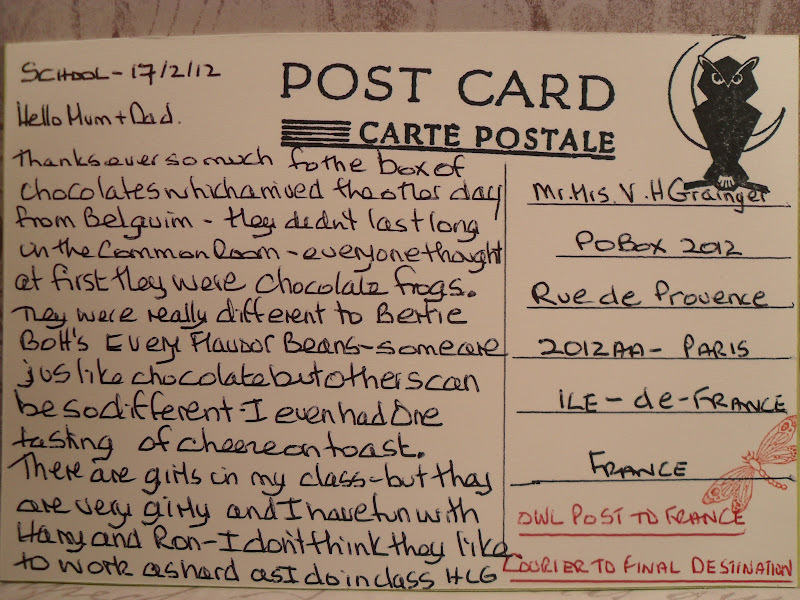 To see my previous postcards, check the Labels or the additional page on the top bar. Thanks for your visit. This week at the Alphabet Challenge, sees us at letter B - Busy Bugs~ any bug you wish, remember it also need not be a card, any crafted item with a bug or bugs. 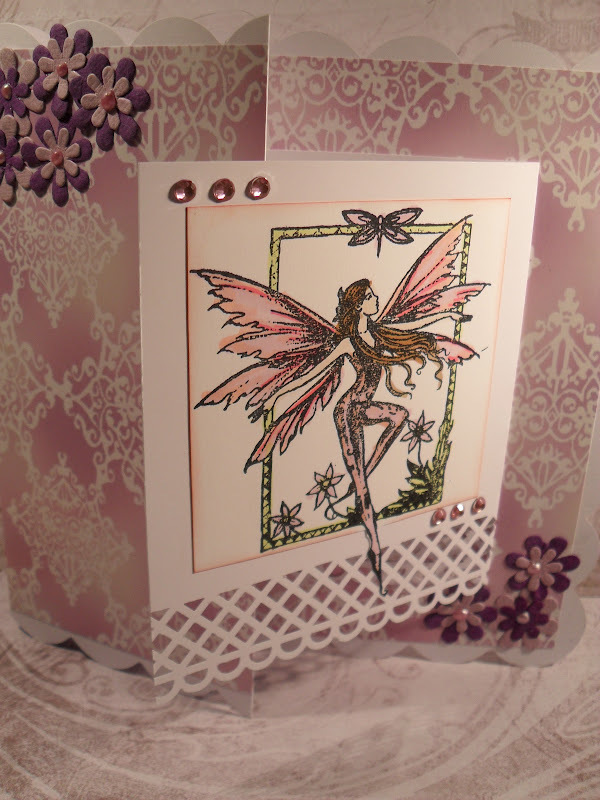 Please do pop over to the blog, for the DT have made some wonderful 'Bug' cards. I so enjoyed visiting your animal antics last week, there were some super cards amongst them. For my card, it is a good coincidence that I used Stamps by Chloe who also happened to be on Create and Craft today with her wonderful stamps. I made my card using a piece of pretty pink paper from my stash. 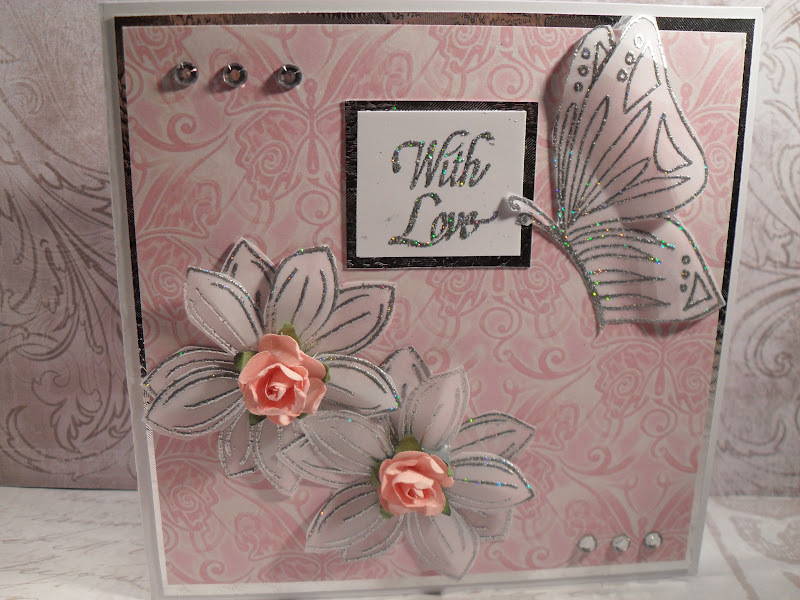 The small flower and butterfly have been stamped onto white vellum and heat embossed with Silver Bells Wow! embossing powder. A few flowers and gems added. Once again I look forward to visiting you to see your bugs. Have fun everyone. Thanks for visiting me and for any comments you may leave, for which I am very appreciative. The one thing I enjoy about paper crafting is the variety available. One week I'm not keen on sketches, the next week I'm having a go. Have you guessed this year I am determined to be more adventurous, to use up some of the stash I've had for years, I've stroked them aplenty, now it's time to get them used. After following them for a few weeks over at Mojo Monday, I felt ready to give a sketch a try, and yes I enjoyed the challenge. Again, I like to make one for a guy and a gal, so I have some cards ready on standby. 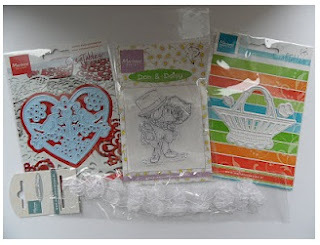 The designer paper is from Papermania Aqua collection, the stamp is also from Papermania ~ Urban set. I'm now going to make one for a gal. thanks so much for looking. I apologise for the delay in welcoming the last four lovely ladies who have become followers, it is so nice to read your comments, which I greatly appreciate. Hi, to all my followers and those who may have just popped on for a sneaky peak after seeing my title. For two days I have been unable to add anything to my blog or access my Dashboard to contact my DT private sites. This came about totally out of the blue. The only information I was given was that Blogger no longer recognised my service provider, I was instructed to go to Google Chrome. I love my blog, it is my contact with the outside world, and I do mean world, for it still amazes me, how small the world has become with the aid of the computer and for me especially in blogland. I also greatly appreciate I can have all of the fun, friendships and contacts as I do for FREE. So I shouldn't grumble, but I have been so upset for the past few days, because I am so computer illiterate, I felt deserted and was unable to do anything. I, however, am lucky, for my son was able to help me out by sorting out Google Chrome for me, so I am now back into the land of blogs. The reason I am adding this to my blog is in case anyone out there is on Internet Explorer and receives the message I described above, for them not to panic as I did, for it does all resolve if you convert to Google Chrome ~ indeed Hobson's choice but better than nothing and better than having to pay for it. 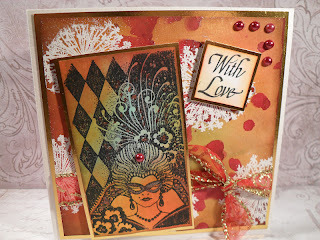 This week at the Rainbow Lady's Challenge it is appropriately for the time of the year Mardi Gras. i am rather late but have had a few computer problems, I so didn't want to miss this challenge. I love the colour and drama of Mardi Gras. I created my own background, with various TH Distress inks and a few splashes of Cosmic Shimmer spritz, only it didn't spritz, the end of the nozzle is obviously blocked. However I guess this is what is called either a big mistake, a happy accident or serendipity, I don't have time before the closure to make another. 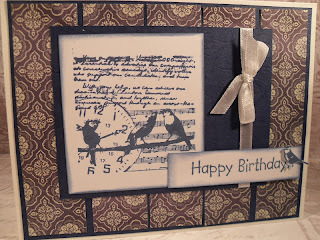 The image is from a stamp by Elusive Images ~ now Chocolate Baroque. 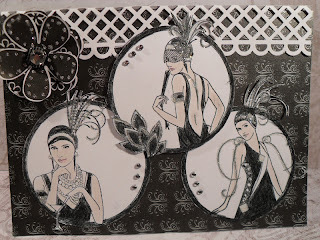 I coloured a piece of card with various Distress inks, then stamped with a Memento Tuxedo Black. Thanks for such a colourful challenge. It is the second week for the theme Mystical, Magical and Fantasy at Top Tip Tuesday. 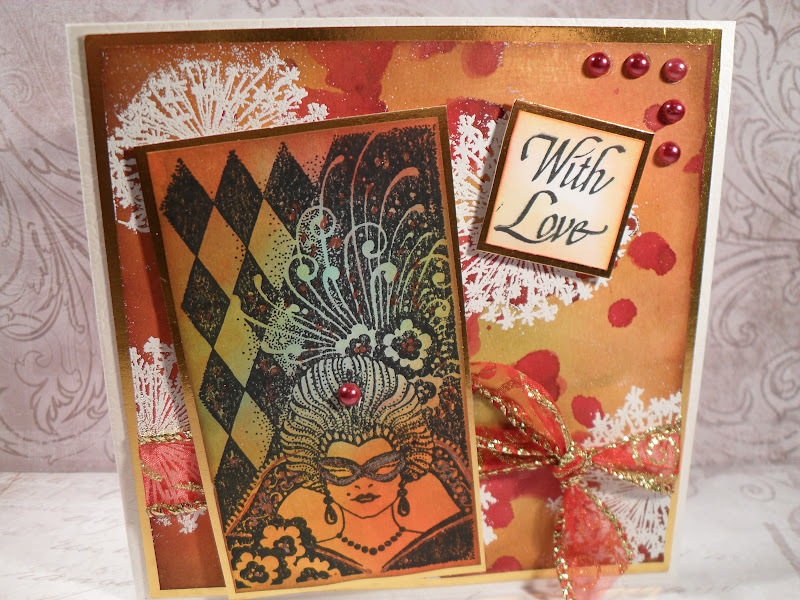 An amazing tutorial, from Elaine for a Flap Opening Card features. I thought I'd give it a try, and greatly enjoyed the card, which was also enjoyed by my card class last Friday, so many thanks to Elaine. 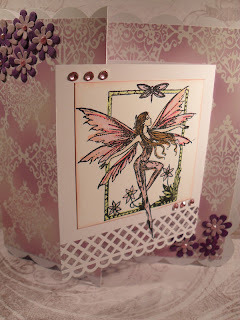 Please do pop over to the blog to check out the tutorial and the lovely samples from the DT. I used papers from my stash. A Martha Stewart border punch. 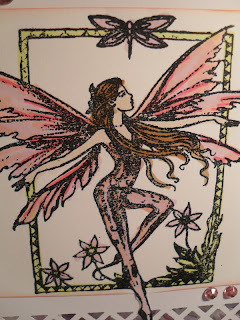 The fairy is from Bravura stamps, coloured with Promarkers. I can't believe I haven't added anything to my blog since Monday, where do the days go? 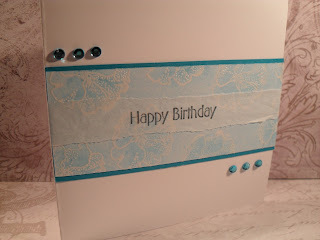 I have been busy, but with Design Team cards and cards for my Card Class today, so I'll add those soon. 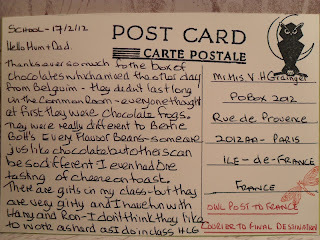 Here we are in Week 7 on Darcy's Postcard Challenge, I'm late today, but I'm here. Before I dare to go to view my fellow travellers I like to post my card, or I may become too intimidated with the wonderful pieces of art and give up. Fortunately I have enjoyed three holidays in Wales, so it wasn't a hard task for me this week. 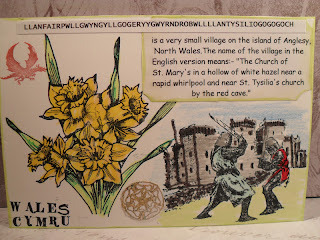 My card shows a symbol of Wales is a Red Dragon, a daffodil is the Welsh flower. Wales in Welsh is Cymru. The small village with the long name, I have given the English version of the name. Castles are abound in Wales. I greatly enjoyed an enactment of Medieval Tournament, with sword fighting, jousting, etc at Beaumaris Castle. The gold coin represents the gold found in Wales, it is customary for Royal persons to have their wedding rings made from Welsh gold. 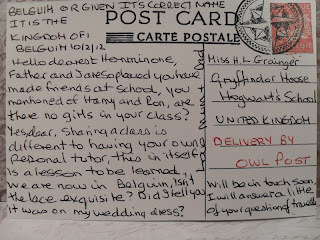 ﻿I am now using an owl stamp for the postcards to and from Hermione and her parents. 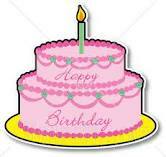 The Cheerful Stamp Pad this week would like a Happy Birthday card, so this is my entry. From one sheet of A4 card I managed to make 4 cards. I used 3 shades of TH Distress Inks, spritzed the whole page with water, then covered it in patches with Sea Salt. If you want more instructions please go here to my Tutorial Blog. This is how the "blotchy" effect is created. thanks for any comments, which are always appreciated. ﻿Don't forget, this month we are being sponsored by Marianne Designs who have donated this amazing prize. 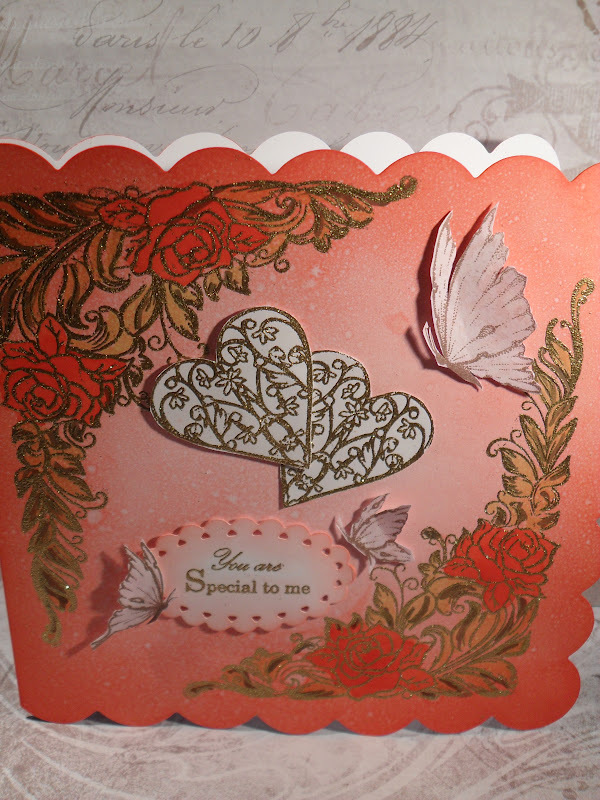 ﻿I used an 8" square card with scallops, coloured it with various depths of Fire Brick Red, the rose and leaves stamp is from My Paper World, the heart stamp is from Papermania, an old favourite of mine. 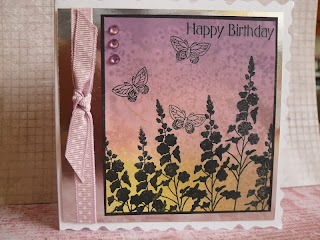 Again I have used Lyndsay Mason's Tattered Butterflies, you will have guessed by now how much I like them. Before stamping and adhering my embellishments I sprayed water over the TH Distress inks which gave the splattered finish. 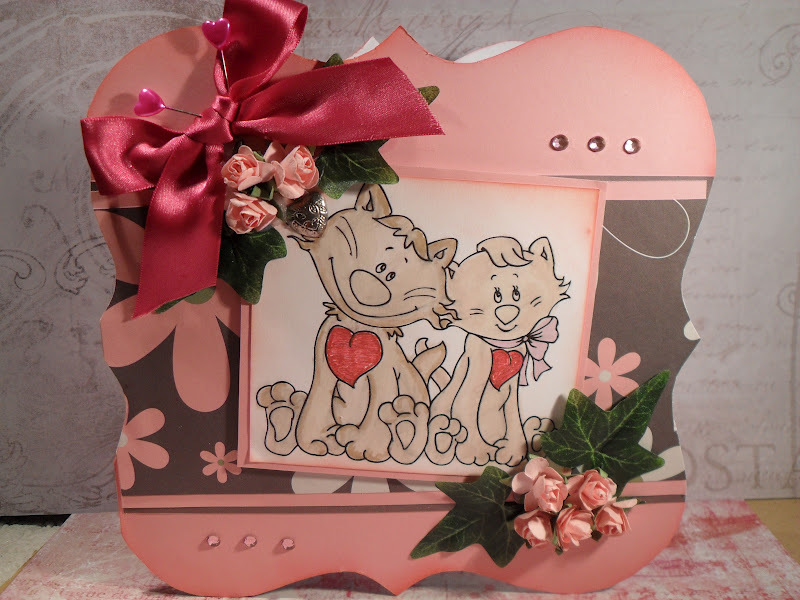 I hope you like the card, there is a lovely selection from the Design Team, also from Meggymay who is our Guest Desginer for the month of February. I look forward again to visiting you all. Love Story with Ribbons and a Dangling Charm. ~~~~~A cute digi stamp. 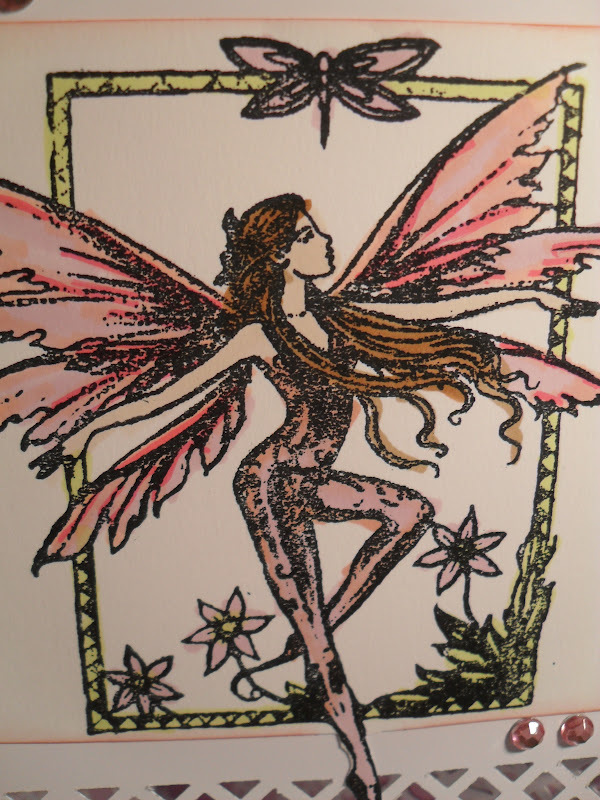 As thrilled as I was, anyone who knows me and my blog will know I rarely do cute, and have never used a digi stamp. However, there are times when we should push ourselves and jump out of our comfort zones and this was one of them. I would like to thank everyone at Quirky Crafts for their faith and support, for I actually had a great time creating this card. The digi stamps were easier to use than I thought, though I coloured them with Promarkers, and maybe the ink wasn't dry enough from the printing. I have added the ribbon and there is a heart charm dangling from the ribbon. 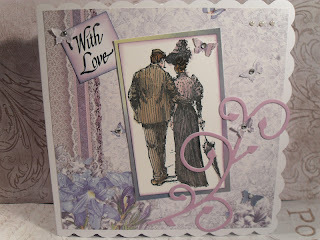 Please pop over and have a look there are some lovely cards to see. Wow! We had some fabulous cards for men, over the last two weeks at Fashionable Stamping Challenges, it's never easy choosing an overall winner and top 3 but this will be a very difficult choice to make for each of the Design Team. For the next two weeks we are asking you to make a project using Monochromatic plus one other colour. Check out the instructions over on the blog to be sure of being in with a chance of winning. Our sponsor, Cottage Crafts offers each winner a choice from her shop to the value of E7. ﻿There is a lot of Love floating around during the early part of February, so here is my Monochrome card in red with a little black for contrast. The three hearts are from a free stamp with a Craft Stamper magazine. 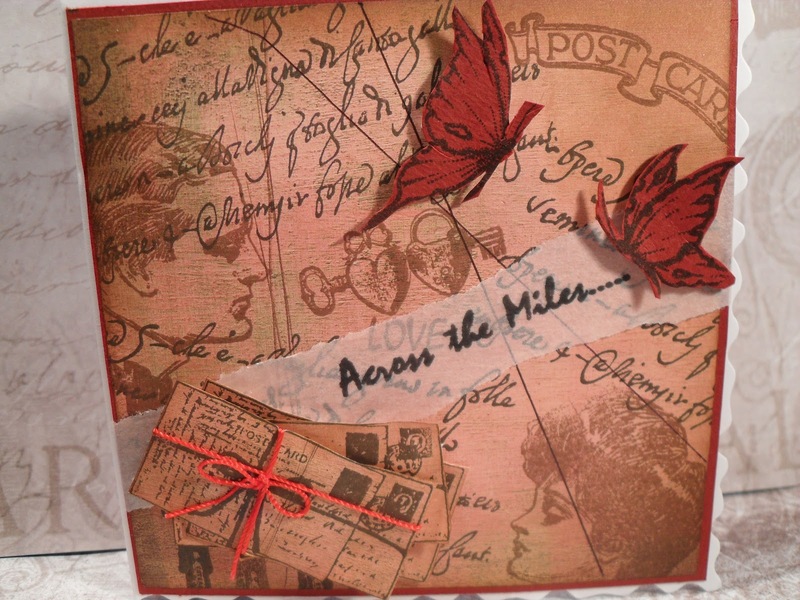 I used Fired Brick TH Distress ink all over the card including the background, which was then stamped with a small text stamp from Paperartsy. 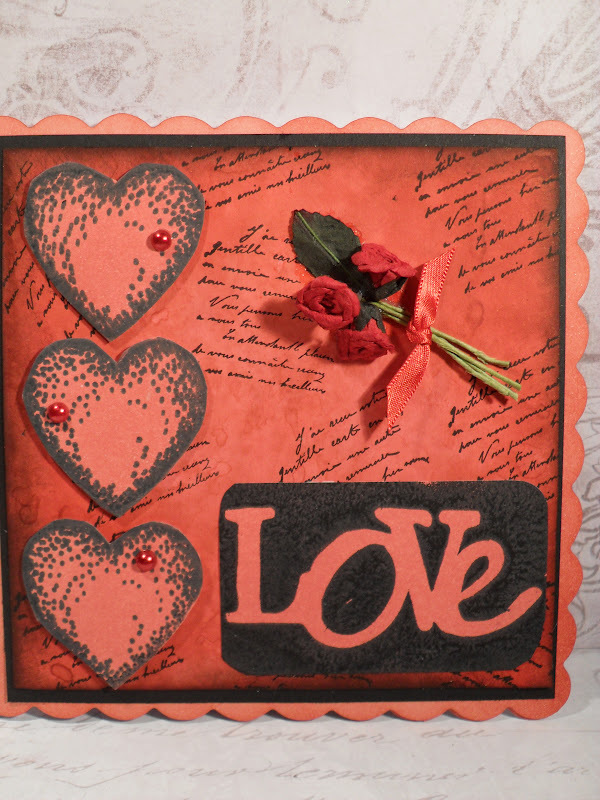 The negative Love stamp is a foam stamp from Papermania. I look forward to once again visiting you over the next two weeks. 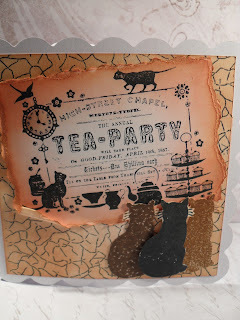 Have fun, there are some amazing samples on the blog by the marvellous Design team, please do take a look. I am entering this card into a few challenge blogs with a theme connected to Valentine's Day. Kingdom of Belguim, the constitutional present monach being King Albert II. I have visited a small area of Belguim, but when I listed what I knew of the country I am ashamed to admit very little. The highly praised and priced hand made lace from Bruge. My most favourite lager is a well known Belguim beer. Chocolates from Belguim yummmee!. 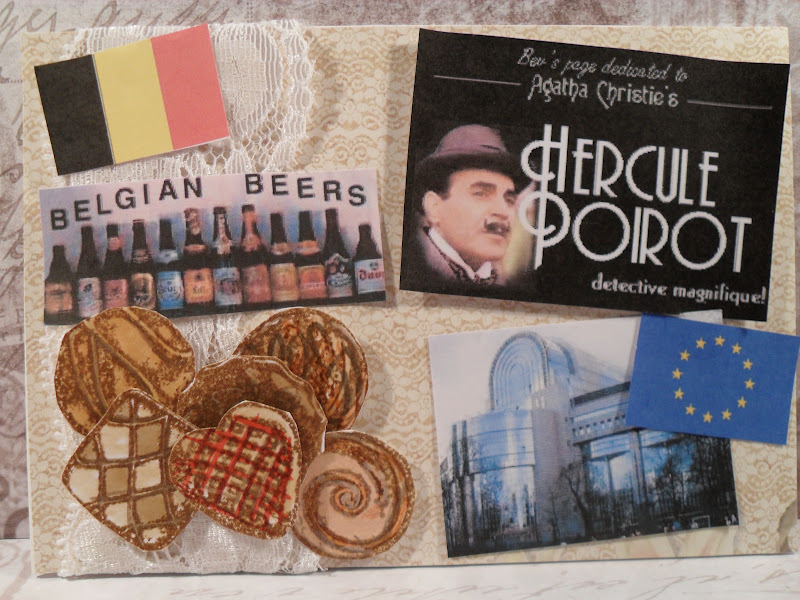 The world's most favourite and well known Belgian detective is of course Monsieur Hercule Poirot, from the pen of Agatha Christie. The European Parliament is based in Brussels, the European Union Flag with the stars and the Belgian flag. There are 3 main languages - Flemish, French and German. 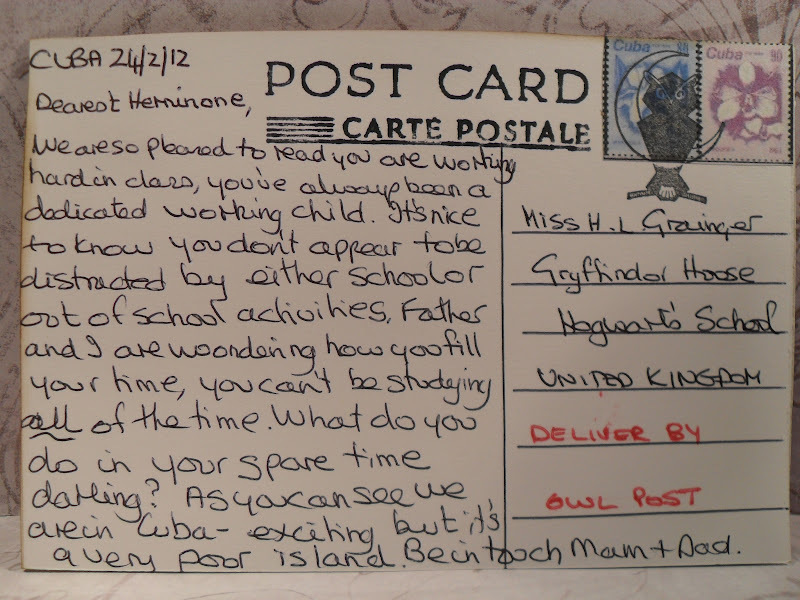 All of these are detailed on my postcard. 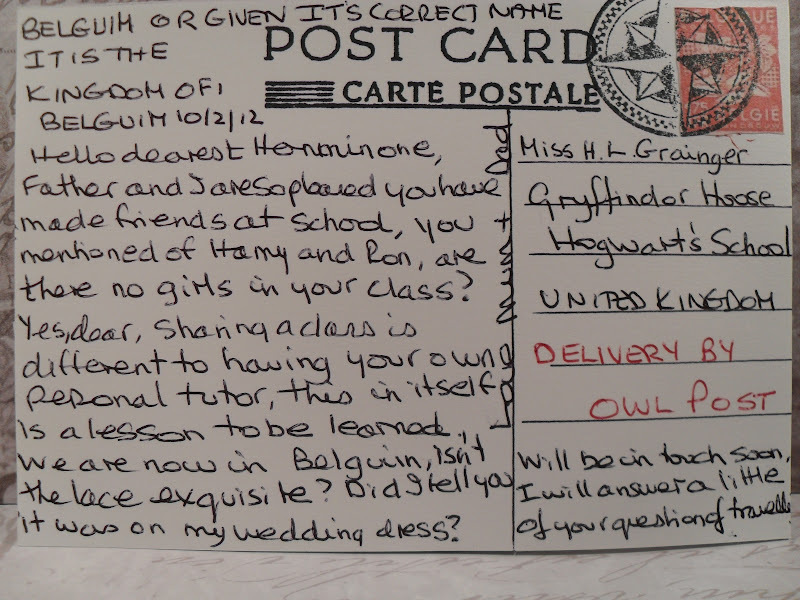 The postcard will of course be delivered by owl post from Mr. Mrs. Grainger, currently in Belguim to their daughter Hermione at the Hogwart's School of Magic﻿, somewhere in the United Kingdom. Roll on Monday, for our next destination. Hope I will be able to do more stamping. 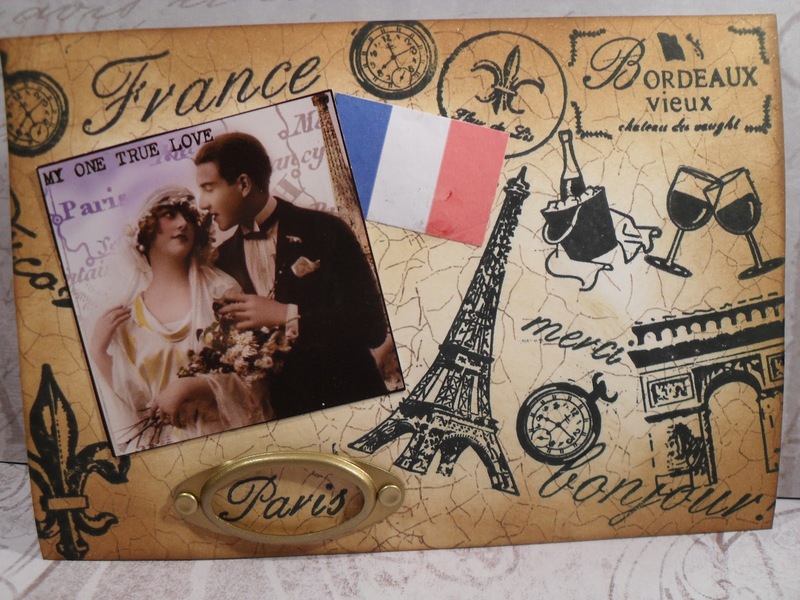 I'm off to post this on Darcy's blog, check out the log on my side bar, and to visit some of my fellow travellers and check out their postcards. It's the start of a new round of the alphabet at the Alphabet Challenge Blog - my first run on the Design Team. I am so pleased to have joined this group and am looking forward to the coming months. Last fortnight we were limited to animals found in a zoo, this week we want to see your Animal Antics. Please remember we accept any form of paperwork for an entry, the rules are few, and we are a fun only blog. We greatly look forward to your creations of showing us animals and their antics, the team have created a wonderful mixed selection which will surely inspire you. 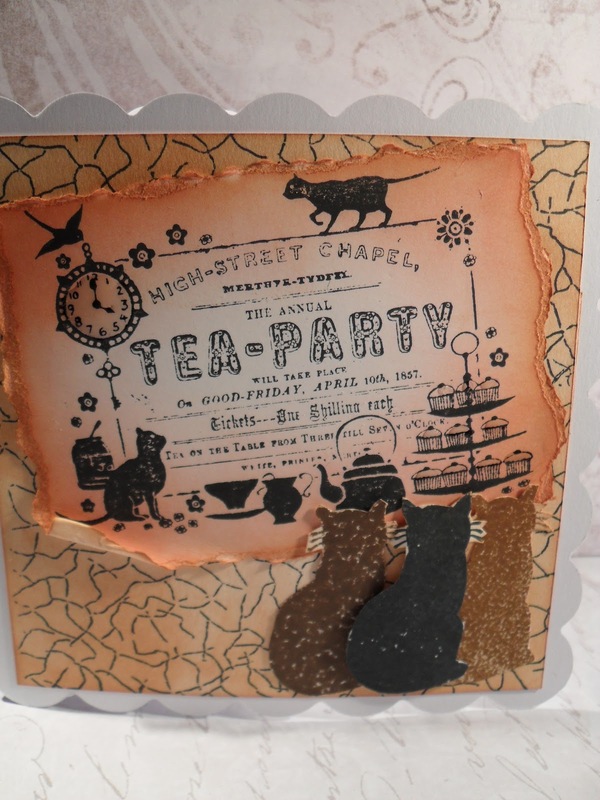 For my card, I stamped a crackled background, coloured it with Tea Dye TH Distress Ink, seemed appropriate, the main image is from a Crafty Individuals stamp and the 3 greedy cats at the front are from a free stamp from the Craft Stamper magazine, stamped in 3 different Distress ink colours. I hope you have fun making your project, looking forward to visiting your blogs. For February at Craft-a-Scene, the challenge is to make a scene with a Winter theme. 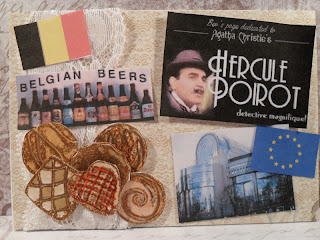 I made this 4" x 4" Fat Page for the Do Crafts Fat Page swap, which has now been posted to my partner. 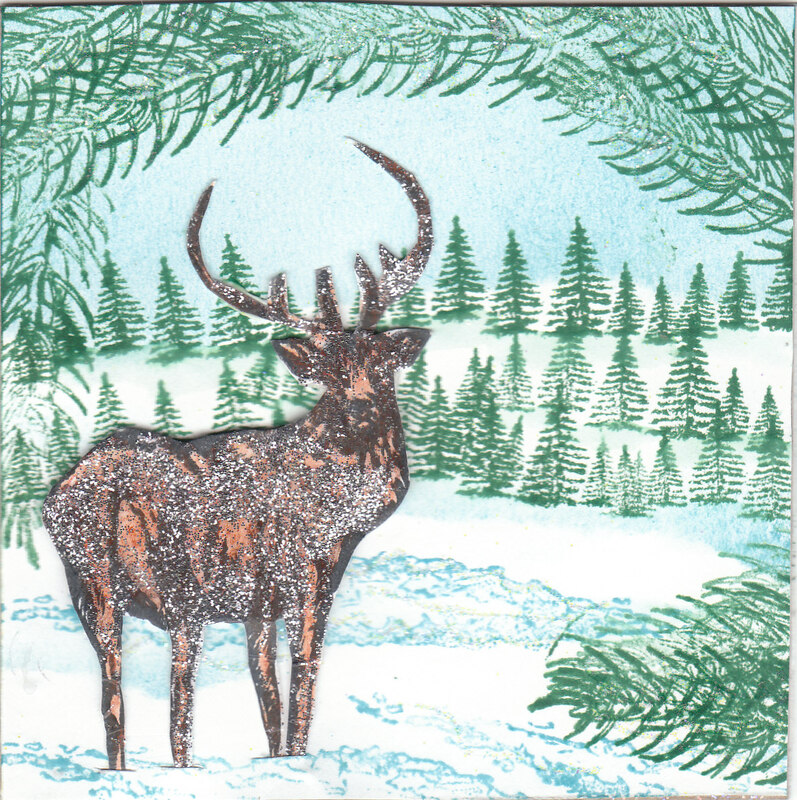 The stamps I used are all from an A5 plate by Creative Expressions, with Winter and Christmas type stamps. I used Memento Cottage Ivy to stamp the greenery. I painted the stag with several of the TH Distress inks brown shades. Labels: Craft a Scene challenges, Creative Expressions, Fat Pages Swap. 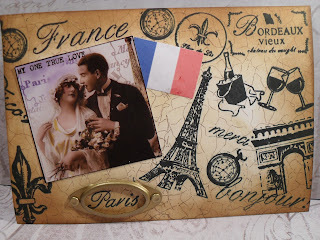 I am so enjoying this journey, it is interesting not only to create my own postcards and hopefully to interest others with the story, but to visit others, many talented artists and crafters, who are travelling their own journey. Reading their stories too. Thanks Darcy and thanks to the ladies who visit me, and to those who leave me comments, I greatly appreciate each and everyone. Roll on next Monday, for our next destination.